Brown boxes may seem plain and uninspiring, but they also create the professional look you want when your package arrives at your customers’ homes. These brown corrugated boxes have a standard, professional look, and they are tough and durable, helping to keep your products protected all the way to their final destination. The single corrugated 200 pound cardboard will hold up to rough handling and other conditions, and you won’t have to worry about your packages being crushed in transit. The boxes meet shipping requirements for major mail services, including the U.S. Postal Service, UPS and FedEx. 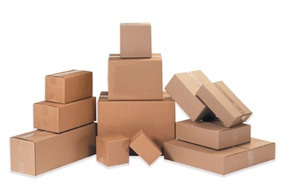 E Supply Store sells boxes in all sizes and shapes to help you find the boxes you need for all your products. Boxes are sold by volume, helping you to save more by buying in bulk. Browse our selection by length to find what you need.